scissors, 15 straws, 60 small paper clips, 30 thin rubber bands. Cut one straw in half. 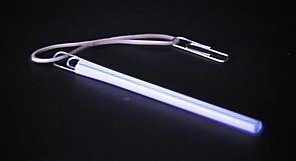 For this model, I started with 8-inch straws, to make the 4-inch struts shown here. Next, build a second strut, and link it to the first as shown. If you partially pull out one paper clip of the first strut, you can easily thread the rubber band of the second strut through it. Have them meet at a point about one third of the way from one end. 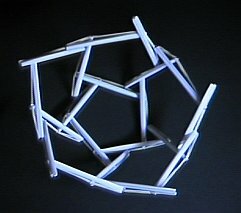 Make three more struts and link them similarly so as to close a 5-sided loop, seen in the center of this figure. This corresponds to one pentagon of the underlying dodecahedron. The one on the right is connected at its two points and so makes a small triangle --- one such triangle appears at each vertex of the dodecahedron. 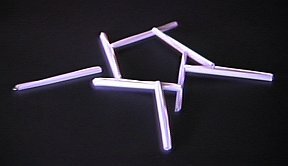 The one in the middle has one of its two connections made and needs a second to close its triangle. The one on the left is in position, but needs both connections. The pentagon and five outward struts of the above steps provide three of the five sides for the next five pentagons, surrounding the central pentagon. Finish each of these five pentagons and you can see half of your complete dodecahedron, as in the figure at right. Just remember to complete each loop of struts to have 5 sides. You are actually two thirds done at this point, as you have used 20 of the 30 struts. 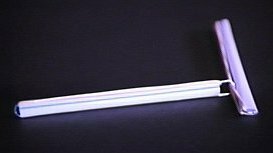 Be careful that the rubber bands are all on the same side: in the image above, the rubber bands are on the top; at right this has been turned over so the rubber bands are on the outside and the straws are on the inside. When done, adjust the struts so they meet each other close to the 1/3 and 2/3 points, and you're done. You will find a huge number of photographs of other tensegrity structures. 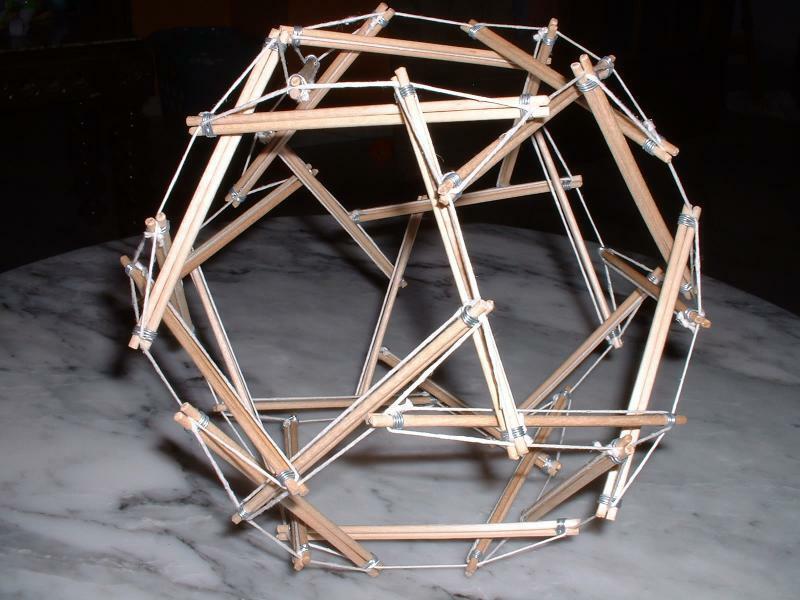 If you wish to learn to generate computer models of tensegrity structure, Antiprism site has the software for free download and use. This page was last edited on 24 November 2018, at 16:38.